Installation of a simple wireless thermometer can warn you of defrosting food in a separate, stand-alone freezer. This is a must for freezers kept in the basement or garage, where you rarely venture. We're always checking the outdoor temperature with one of these, so why not the freezer too? After all, there is no sense losing all that food just because someone leaves the freezer door ajar! Install batteries in wireless temperature transmitter and receiver. Place transmitter on top shelf of freezer or attach to freezer ceiling/lid. Install temperature receiver in kitchen above the sink, on the refrigerator door, or anywhere where it will be checked frequently/periodically. Place transmitter in the highest location in the freezer...warm air rises. For manual defrost freezers, dangle transmitter from a short cord so it doesn't touch the freezer shelves, sides or top and get iced-in. 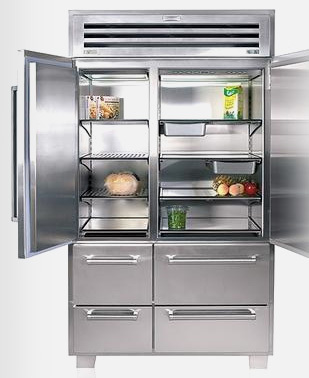 Auto-defrost freezers do warm up periodically to remove frost. You will get to know your freezer's schedule. Normal deep-freeze temperature is between 0 and -5 degrees Fahrenheit.